This was formerly my main telescope for imaging purposes, and was used to produce all of my deep sky images up until February 2014. I was sorry to see it go, but in the end, it had to in order to partly fund my Starwave 102ED. It’s an 80mm Semi-Apochromatic refractor, with a focal length of 480mm, and so a focal ratio of f6, which makes it reasonably ‘fast’. It’s only a doublet (i.e. it has two lens elements), so the colour correction is not as good as Id like. However, it seems extremely sharp, and has given me good results so far with a DSLR attached. As for all scopes of this size, it’s use as a visual instrument is fairly limited when compared to my 200mm Newtonian. However, it’s far quicker to get set up and start imaging than the Newt, and gives me a much wider field image. It has a nice smooth (but single-speed) Crayford focuser. This struggled with the weight of the Canon 5D (which is built like a tank, and weighs about the same), but seems to be okay with the, much lighter, 1100D. I focus it using a small Bahtinov mask. The diagonal I’m using in this picture is actually a Televue 1.25″ diagonal, which is used just to align the scope for GoTo. However, I’m trying to get away from using it at all, and align using the camera’s LiveView mode and APT, along with SkySafari and EQMOD. 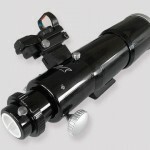 Due to me not having a permenant observatory-type setup, I need something that I can set up and pack up quickly, and this scope fits that bill nicely. 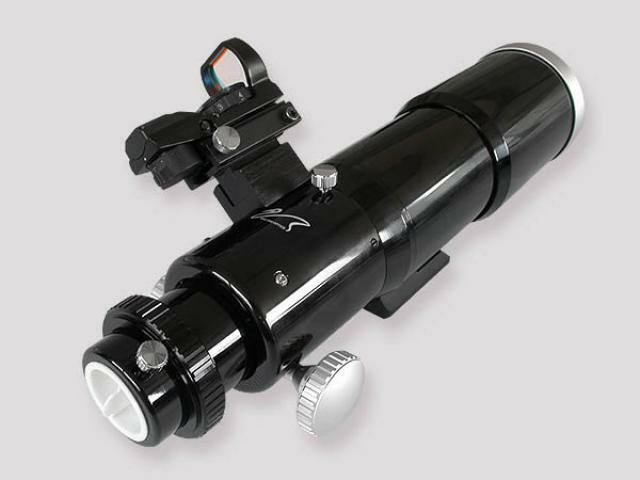 From what I can tell, it seems to pretty much be a clone of the same type of William Optics scope, down to the screw placements and accessory compatibility. I’m going to fit a WO-type finder mount, along with a RDF for alignment purposes. Also, its good to know that if any WO accessories come up cheap somewhere, they’re likely to be reasonably compatible.